Mdm. Wong Poh Geok is the co-founder and Finance Director of the company. Mdm. Wong joined Wing Tuck Engineering Works in 1978 when it became a sole-proprietor company. She dedicated her full services to assist and manage the operation of Wing Tuck Engineering Works. Her contribution has been to restructure the Company into various departments, headed by individual department heads and operating in a seamless and efficient manner. Mdm. Wong supervises daily Administrative and HR works, Procurement and Accounting works of the Company. To enhance smooth functioning of the company, she further attended courses mainly accounting, booking, HR and personnel development. When the Company was converted to private limited in 1988, Mdm. Wong enrolled to pursue a Diploma in Business Administration and Management in Singapore Institute of Management (SIM) in 1994. She got her diploma in 1996. Besides, she also obtained certifications in computer training and other computer-related courses to streamline the Company’s daily operation. Mr. Chong is the founder and Executive Chairman of the company. He was born to a lower income family with 8 siblings. Poor family background had forced him to step into the working society after completing his secondary two educations. He started off as an apprentice learning engineering and steel works. After 6 years of apprenticeship, Mr. Chong together with 2 partners started Wing Tuck Engineering Works in 1971. They worked in a small commercial area of 700 square feet. The main scope of the business was getting sub-contracting works mainly in fuel management, machinery and repair works. Wing Tuck Engineering Works business was mediocre potential even after 7 years of hard-work which resulted in the 2 business partners resigning. Mr. Chong, however, saw the potential of the company and decided to pursue on as sole-proprietor. Despite all difficulties in maintaining the business, Mr. Chong continued his endeavors in ensuring the sustainability of Wing Tuck Engineering Works. In 1979, Mr. Chong’s expertise and familiarity in the industry had led him to re-focus onto the next business opportunity. He thus shifted gradually from machinery and engineering works to works related to the growing Petroleum Industry. Maintenance works at that time was growing and so were commercial fuel management systems. This strategic move was the turning point of Wing Tuck Engineering Works and it proved to be rewarding in the years ahead. Manu awards and accolades were won and given by institutions and government for its exemplary works and contribution to society. 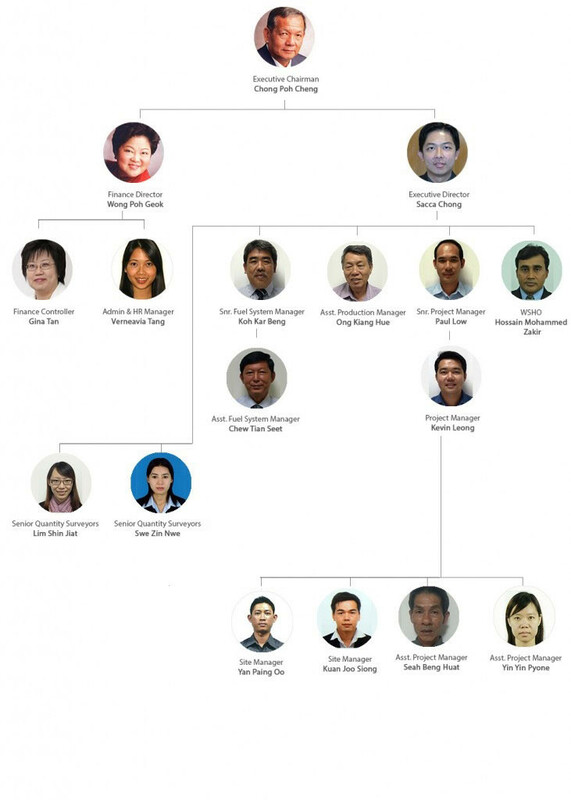 Wing Tuck Engineering Pte Ltd was officially registered to Private Limited Company in 1988. From its humble beginning as a small operation with merely 3 employees and a turnover of $10,000 in Year 1971, it has grown to an operation with an annual turnover of $10 million and over 100 highly-skilled employees. Wing Tuck Engineering Pte Ltd has grown steadily over the years and continues to flourish, expand and achieve numerous breakthroughs in business results despite several economic downturns and recessions. The continuous growth is attributed to Mr. Chong’s commitment to provide high standard of workmanship and excellent service to his clients. Mr. Chong’s perseverance, extensive experience and vision have pushed Wing Tuck Engineering Pte Ltd’s operation to a greater height and set the pathway for the future success of the company. Mr. Sacca Chong was appointed as Executive Director of the Company on June 2008. He had been a part-time trainee in Wing Tuck Engineering Pte Ltd since Year 1991 and had to learn everything from welding, steel fabrication and installation, civil and architectural works and fuel system from scratch to gain exposure and experience. He had shown great enthusiasm in his works which had sparked off his interest in civil engineering and oil and gas industry. He then went overseas to pursue further study in related fields before joining the company officially as Project coordinator in December 2001. Due to the wide spectrum of works that he had learned and did as a trainee in the early days, he quickly adapted to the company’s cultures, norms and performed extremely well in his job. He was later promoted to Project Manager in Year 2002. Since then, he has been actively involved in project management and project operations and had successfully pushed the organization to a greater height by achieving and surpassing higher quality performance and profitability. He was later promoted to General Manager in Year 2006 and subsequently appointed as Executive Director in Year 2008. He is responsible for corporate management, corporate restructuring, formulating business development plans and spearheading the company’s directions and strategies. He is the key personnel responsible to the development of and the accomplishment of the organization-wide business plans and objectives including successfully spearheaded the company’s diversification into Fuel System in Year 2006 which accounted for the growth of the company. In addition, he had also integrated the ISO 9000 and OSHAS 18000 together to successfully develop and implemented the company’s Quality, Occupational Health, Safety and Environmental (QHSE) Manual into the organization which brings the organization to a new level of professionalism, quality and safety assurance. His active involvement in Oil & Gas Industry and construction industry has gained him wealth of experience, in-depth knowledge, skill and expertise in wide spectrum of works. A top five university in Australia, Mr Sacca Chong graduated from University of New South Wales, Sydney in Year 2002 with a Bachelor of Engineering Degree in Civil Engineering (First Class Honours). Subsequently, he attained Master of Engineering Science in Project Management in Year 2004 by pursuing external studies from University of New South Wales.